We are pleased to report that $4,675 was raised on the night and fierce competition amongst the 80 guests ensured a close battle for quizz night champions. The AGM presentation "The Story So Far - 4 years in". 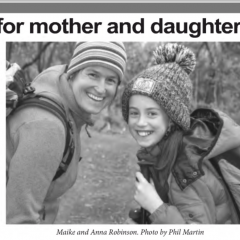 Newspaper Article 27 Sept 2017, Yangri Peak Trek October 2017 preparations for mother-daughter Maike and Anna Robinson from Adelaide.